I have not had the time to write much about climate of late, but after several years of arguing over emails (an activity with which I quickly grew bored), the field is heating up again, as it were. As I have said many times, the key missing science in the whole climate debate centers around climate sensitivity, or the expected temperature increase from a doubling of CO2 concentrations in the atmosphere (as reference, CO2 in the industrial age has increased from about 270 ppm to close to 400 ppm, or about half a doubling). In my many speeches and this video (soon to be updated, if I can just find the time to finish it), I have argued that climate computer models have exaggerated climate sensitivity. This Wikipedia page is a pretty good rehash of the alarmist position on climate sensitivity. According to this standard alarmist position, here is the distribution of studies which represent the potential values for sensitivity - note that virtually none are below 2°C. The problem is that these are all made with computer models. They are not based on observational data. Yes, all these models nominally backcast history reasonably correctly (look at that chart above and think about that statement for a minute, see if you can spot the problem). But many an investor has been bankrupted by models that correctly backcast history. The guys putting together tranches of mortgages for securities all had models. What has been missing is any validation of these numbers with actual, you know, observations of nature. Way back 6 or 7 years ago I began taking these numbers and projecting them backwards. In other words, if climate sensitivity is really, say, at 4°C, then what should that imply about historical temperature increases since the pre-industrial age? Let's do a back of the envelope with the 4°C example. We are at just about half of a doubling of CO2 concentrations, but since sensitivity is a logarithmic curve, this implies we should have seen about 57% of the temperature increase that we would expect from a full doubling of CO2. Applied to the 4°C sensitivity figure, this means that if sensitivity really is 4°C, we should have seen a 2.3°C global temperature increase over the last 150 years or so. Which we certainly have not -- instead we have seen 0.8°C from all causes, only one of which is CO2. So these high sensitivity models are over-predicting history. Even a 2°C sensitivity over-predicts the amount of warming we have seen historically. So how do they make the numbers fit? The models are tuned and tweaked with a number of assumptions. Time delays are one -- the oceans act as a huge flywheel on world temperatures and tend to add large lags to getting to the ultimate sensitivity figure. But even this was not enough for high sensitivity models to back-cast accurately. To make their models accurately predict history, their authors have had to ignore every other source of warming (which is why they have been so vociferous in downplaying the sun and ocean cycles, at least until they needed these to explain the lack of warming over the last decade). Further, they have added man-made cooling factors, particularly from sulfate aerosols, that offset some of the man-made warming with man-made cooling. Which brings us back to the problem I hinted at with the chart above and its distribution of sensitivities. Did you spot the problem? All these models claim to accurately back-cast history, but how can a model with a 2°C sensitivity and an 11°C sensitivity both accurately model the last 100 years? One way they do it is by using a plug variable, and many models use aerosol cooling as the plug. Why? Well, unlike natural cooling factors, it is anthropogenic, so they can still claim catastrophe once we clean up the aerosols. Also, for years the values of aerosol cooling were really uncertain, so ironically the lack of good science on them allowed scientists to assume a wide range of values. 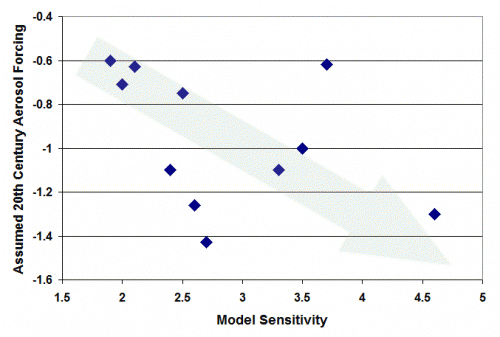 Below is from a selection of climate models, and shows that the higher the climate sensitivity in the model, the higher the negative forcing (cooling) effect assumed from aerosols. This has to be, or the models would not back-cast. The reasons that these models had such high sensitivities is that they assumed the climate was dominated by net positive feedback, meaning there were processes in the climate system that would take small amounts of initial warming from CO2 and multiply them many times. The generally accepted value for sensitivity without these feedbacks is 1.2°C or 1.3°C (via work by Michael Mann over a decade ago). So all the rest of the warming, in fact the entire catastrophe that is predicted, comes not from CO2 but from this positive feedback that multiplies this modest 1.2°C many times. I have argued, as have many other skeptics, that this assumption of net positive feedback is not based on good science, and in fact most long-term stable natural systems are dominated by negative feedback (note that you can certainly identify individual processes, like ice albedo, that are certainly a positive feedback, but we are talking about the net effect of all such processes combined). Based on a skepticism about strong positive feedback, and the magnitude of past warming in relation to CO2 increases, I have always argued that the climate sensitivity is perhaps 1.2°C and maybe less, but that we should not expect more than a degree of warming from CO2 in the next century, hardly catastrophic. One of the interesting things you might notice from the Wikipedia page is that they do not reference any sensitivity study more recent than 2007 (except for a literature review in 2008). One reason might be that over the last 5 years there have been a series of studies that have begun to lower the expected value of the sensitivity number. What many of these studies have in common is that they are based on actual observational data over the last 100 years, rather than computer models (by the way, for those of you who like to fool with Wikipedia, don't bother on climate pages -- the editors of these pages will reverse any change attempting to bring balance to their articles in a matter of minutes). These studies include a wide range of natural effects, such as ocean cycles, left out of the earlier models. And, as real numbers have been put on aerosol concentrations and their effects, much lower values have been assigned to aerosol cooling, thus reducing the amount of warming that could be coming from CO2. Recent studies based on observational approaches are coming up with much lower numbers. ECS, or equilibrium climate sensitivity numbers (what we would expect in temperature increases if we waited hundreds or thousands of years for all time delays to be overcome) has been coming in between 1.6°C and 2.0°C. Values for TCS, or transient climate sensitivity, or what we might expect to see in our lifetimes, has been coming in around 1.3°C per doubling of CO2 concentrations. Yesterday saw the publication of a paper in a prestigious journal,Nature Geoscience, from a high-profile international team led by Oxford scientists. The contributors include 14 lead authors of the forthcoming Intergovernmental Panel on Climate Change scientific report; two are lead authors of the crucial chapter 10: professors Myles Allen and Gabriele Hegerl. So this study is about as authoritative as you can get. It uses the most robust method, of analysing the Earthâs heat budget over the past hundred years or so, to estimate a âtransient climate responseâ â the amount of warming that, with rising emissions, the world is likely to experience by the time carbon dioxide levels have doubled since pre-industrial times. The most likely estimate is 1.3C. Even if we reach doubled carbon dioxide in just 50 years, we can expect the world to be about two-thirds of a degree warmer than it is now, maybe a bit more if other greenhouse gases increase tooâ¦. This is still tough work, likely with a lot of necessary improvement, because it is really hard to dis-aggregate multiple drivers in such a complex system. There may, for example, be causative variables we don't even know about so by definition were not included in the study. However, it is nice to see that folks are out there trying to solve the problem with real observations of Nature, and not via computer auto-eroticism. Postscript: Alarmists have certainly not quit the field. The current emerging hypothesis to defend high sensitivities is to say that the heat is going directly into the deep oceans. At some level this is sensible -- the vast majority of the heat carrying capacity (80-90%) of the Earth's surface is in the oceans, not in the atmosphere, and so they are the best place to measure warming. Skeptics have said this for years. But in the top 700 meters or so of the ocean, as measured by ARGO floats, ocean heating over the last 10 years (since these more advanced measuring devices were launched) has been only about 15% of what we might predict with high sensitivity models. So when alarmists say today that the heat is going into the oceans, they say the deep oceans -- ie that the heat from global warming is not going into the air or the first 700 meters of ocean but directly into ocean layers beneath that. Again, this is marginally possible by some funky dynamics, but just like the aerosol defense that has fallen apart of late, this defense of high sensitivity forecasts is completely unproven. But the science is settled, of course. In a recent Los Angeles Times op-ed, "Overselling Capitalism,"
University of Maryland Professor Benjamin Barber wrote of the "crisis"
Here is a big reality check for professor Barber: The fact that a few mortgage companies got overly generous in extending mortgage credit does not mean that the work ethic and entrepreneurship is dead. In fact, they are virtually unrelated topics. If the price of something is reduced, more is going to be consumed. Suppliers of credit reduced the price of credit, too far as it turned out to make a profit, and more was consumed. This does not represent so tragic change in the human makeup, it is just supply and demand at work, like normal, and some bad business judgement. In fact, I can't get over the class-based condescension that seems to fill every nook and cranny of the commentary on the mortgage bubble bursting. When in the late 1990's, rich VC's provided too much money too cheaply to yuppies running Internet companies, I don't remember anyone lamenting a shift in human motivation or a failure of capitalism. But when banks provided too much capital too cheaply to lower income people for home mortgages, suddenly all those lower-income people are representative of the failure of capitalism and the work ethic. Circumscribing the "War on Terror"
The administration is going too far in using the war as an excuse to circumvent a number of Constitutional protections, from habeas corpus to search and seizure. This does not mean that I am necessarily against all new activities, but they need to be initiated within our Constitutional framework. Take surveillance activities. Its not unreasonable to think that terrorism demands new surveillance tools. But the principle we have always followed for surveillance is that Congress authorizes the power and the judiciary gets some type of review of the targets and methods. Bush seems to have become impatient with separation of powers to the point that he does not even try to engage the other arms of the government, instead using the war to claim a fiat power. (It should be noted that even when the separation of powers is respected, as with the Patriot Act, mistakes are made and we can go too far. However, at least we can debate it and there are Congressmen we can hold accountable). The second category of problem I have is with the open-ended nature of the war. Calling this the "War on Terror" is only marginally more precise and limiting than saying we are fighting the "War against Bad Stuff." If one asks, "Who are we fighting", the administration answers "Whoever the President says we are fighting against". If one asks "When is it over" the administration either answers "Whenever the President says it is" or else, probably more honestly, they say "not for a long, long time." In terms of civil liberties, the second point may be the most problematic. Most citizens will grant the President some special war powers (as in fact the Constitution does), though we can argue whether the current administration has gone too far in defining these powers for themselves. But if you combine this with letting the administration define exactly who the enemy is and how long the war lasts, it makes for a combination deadly to civil liberties. Take the example of detention of enemy combatants. Administration supporters argue that we have always been authorized to hold enemy combatants until the end of the war, as we did in WWII. And so we did. We were at war with Germany, so we detained German soldiers we captured until the end of the war. Note that these are definitions that everyone at the time could agree on -- ie everyone knew what a German soldier was and everyone knew that "end of the war" meant when we marched into Berlin. Few German detainees were held for much more than a year. By the way, it is interesting to note that even in WWII, we abused this notion. The administration defined "enemy combatant" as "anyone in the US of Japanese descent", so that we ended up interning innocent American citizens for years, much to our shame today. However, in the current "war", an enemy combatant is anyone the administration says is an enemy combatant (at least in their theory) and "for the duration" means as long as the administration cares to hold them, up to and including "forever." Conservatives wish to argue that the "War on Terror" is a new kind of war and demands new tools to fight it, which they use to justify all kinds of secret searches and detainments. Fine, but then it also needs new types of civil liberties checks. Coming back to our detention example, in WWII it was not really necessary to have some kind of judicial review on the question of whether a captured German soldier was an enemy combatant; the uniform was a pretty good giveaway. However, such a review is necessary today, since the enemy combatants languishing at Gitmo (many of who I am willing to believe are bad guys) don't have any identifying uniforms or paperwork. simply retreat from them. That is why I favor much stronger accountability for agencies engaged in surveillance. It is why I am proposing here a formal process for naming our enemies. Category: International Affairs | Comments Off on Circumscribing the "War on Terror"
about 1.2 million per month. Wal-Mart has also done more than its share in contributing to global peace. rural Chinese remaining, many of whom are living on less than a dollar per day. When I get an odd or inappropriate Christmas gift, I usually get a good chuckle with the family and then try to figure out who to recycle it to next year (though the Chia Shrek may be a keeper). When economists get a bad gift, they try to quantify deadweight loss to the economy. And, according to Marginal Revolution, the number is substantial. Is Global Warming Advocacy Killing Science? I worry that global warming advocacy has crossed the line from science to religion, such that data counter to the basic mantra is considered heresy rather than scientific discourse. We have to offer up scary scenarios, make simplified, dramatic statements, and make little mention of any doubts we have. Each of us has to decide what the right balance is between being effective and being honest. More here from Arizona Watch. I do disagree a bit with using the Nature Conservancy as a proxy for all environmental groups. Though they advocate things I don't agree with, the vast majority of their funds go to actual preservation rather than political advocacy (unlike Sierra Club or others). They are actually one of the better examples of trying to use private voluntary action rather than the government to reach some environmental goals. I have written more on Kyoto here. A good recent article in TCS by George Taylor talking about the panic around arctic temperatures is here. Kyoto and similar protocols are dying, and for entirely predictable reasons. Story in TCS from Buenos Aires. The conventional wisdom that it's the United States against the rest of the world in climate change diplomacy has been turned on its head. Instead it turns out that it is the Europeans who are isolated. China, India, and most of the rest of the developing countries have joined forces with the United States to completely reject the idea of future binding GHG emission limits. At the conference here in Buenos Aires, Italy shocked its fellow European Union members when it called for an end to the Kyoto Protocol in 2012. These countries recognize that stringent emission limits would be huge barriers to their economic growth and future development. None too soon for me.